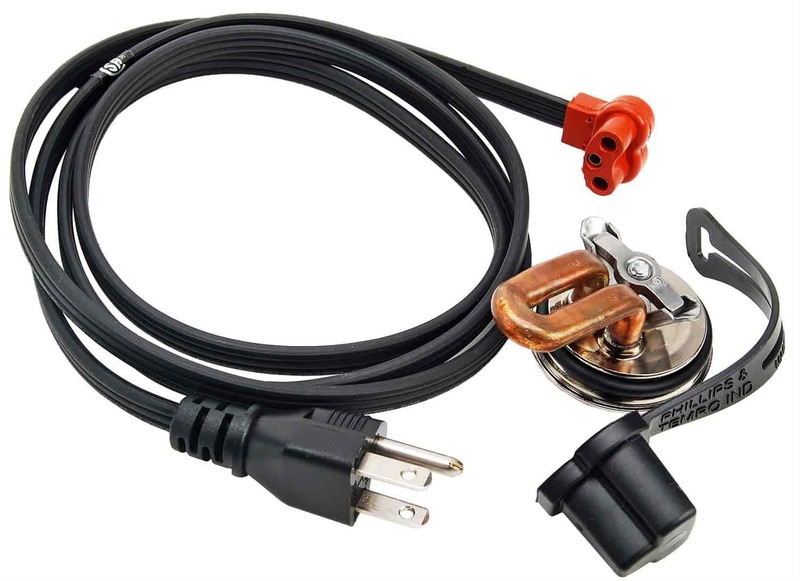 JEGS Core Plug Block Heater is the essential item your engine is screaming for! Not just for cold and icy mornings but ideal for race cars too! Preheating your engine's coolant and oil prevents wear and tear on vital engine components by radiating heat to surrounding components, such as engine bearings, valvetrain, intake manifold, transmission, and starter, which will allow for easier cranking and engine starting. Brings the engine to operating temperature quicker by cutting warm-up time in half, saving fuel and engine run time. Considerable testing on Alky-burning bracket cars showed a savings of 2-1/2 to 3 gallons of alcohol warming up on a 60° day! We tested big block Chevy bracket dragsters; one heater heated to a 90° water temperature, and two heaters to a 110° water temp (heaters left on for an hour). We suggest using one heater per side on V8s for quicker heating results. Installs easily into a core plug hole in the block and comes complete with a 4-1/2' grounded power cord.